WIAW: A Vegan, Omnivore and a Toddler Eat Together. What? Really, you say? Yes, we do! I thought this week’s WIAW would take on how we eat together (most days). My husband is a vegan and I am not. I will never be a vegan because I love cheese, fish and some meats….and that’s okay. We are not raising our daughters to be vegans but will expose them to all foods as they grow up. When they are old enough and can decided what they want to eat or not eat and it will be their choice.The great thing about having a vegan, omnivore, toddler AND baby in the house is that we can make a variety of meals to suit everyone’s needs and eat healthy. I’ve written about my food philosophy before and am happy with the way we eat. By now, you must be thinking “okay, so how do you make a meal for everyone to eat” ? Good question. Some days I go all out making a vegan only meal. Some days I make a vegan meal and add meat. And other days I make a meat meal for Lilly and I, then let my husband figure out his own meal. That’s life! I’ve shared one way I make everyone happy over at Thinking Outside The Sandbox – Family. Introducing a baby to new foods is always fun. Hilary is now starting to eat more of the same meals we are which is awesome! She’s open to trying new foods and usually has a funny face that goes along with the new food. Introducing a toddler to new foods is way more challenging than I ever thought. We try hard to provide healthy food but sometimes you just have to go with what is quick and what they will eat. Lilly has really surprised us with some foods: she loves spicy pakora’s from the farmers market, hummus, pesto, and good cheese. She’ll never be vegan because she loves cheese way too much. She is slowly eating more veggie’s (spinach, red/green/yellow and orange peppers) beans and nuts. Salmon, mashed potatoes, carrots, corn, peas and toasted rosemary bread. 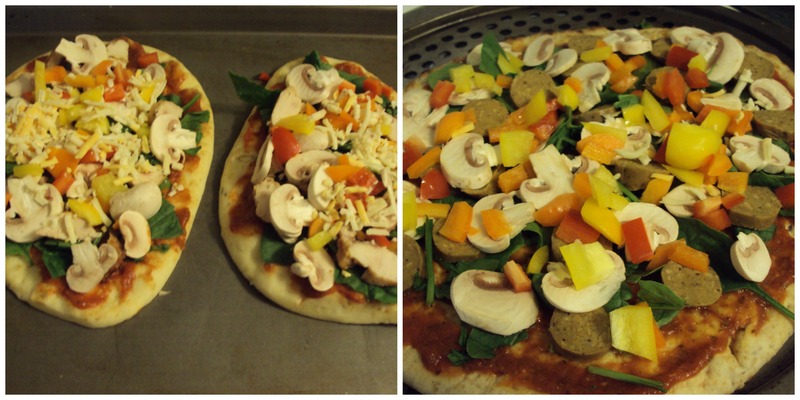 Home made pizza; chicken on the left and vegan tofurky sausage on the right. Lilly’s bite size pizza not shown: small slider burger bun with sauce and cheese. So, how to you meet the needs of your family’s food requirements? Oh man I can only imagine it takes some creative planning to always have meals everyone will eat!! Luckily I am the veggie eater here, so it’s pretty easy to come up with meals that make me happy and then toss in meat for David. It’s great you’re finding a way to enjoy the variety in your house! But yeah it must take a good amount of creativity and little bit of patience too lol. I’m an incredibly picky eater, but when I was younger my mom refused to make separate meals to please everyone (which I agree with). I had to learn to try things, and I think she would do something similar to what you do- she would make something vegetarian (for me- not a vegetarian but I don’t like much meat), and then add meat to part of it to please everyone else. I think Zach and I’s favorite meal to cook and eat together is our homemade pizza, funny enough :). We have become pros over the year (we make it once a week. . . it’s good), but because of that we also have lots of fun nights and memories with it. Always a favorite! We are hoping to start a “pizza night” with the girls when they are older. Making a different pizza each Friday night. I think it’s cool that you guys are able to all eat together, even if sometimes it has to be different varitations! I really enjoy eating together as a family…though with a toddler it can be challenging just to get her to finish her meal. I like that we are exposing our girls to a variety of foods (meat/vegan etc) – way more than I had growing up! Vegan tofurky? I eat meat only because I know it has important nutrients in. If I knew I could get them purely from vegetables and I’d be okay I would stop eating meat…But I don’t like the idea of Quorn (I’m not sure if you have heard of it, Its a meat replacement. I’m not keen on mushrooms though and I think they make up a large percentage) And I’ll worry that I wont be taking in enough of everything…. I’ve never heard of Quorn…sounds…interesting 🙂 I’m not a fan of tofurky but my husband eats it from time to time. I think it might only be in England. I think its a mix of beans and mushrooms, to make vegetarian sausages, mince, ect. Part of me wants to try it, part of me doesn’t! but then I grew up with everyone eating meat and no alternative, so trying new things is a little harder! I think anyway!